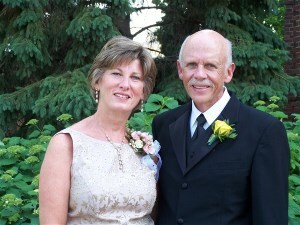 Ellen and Michael McVay were returning from Minneapolis, where they had been visiting their children. Ellen, who was driving, was having trouble keeping the car in the middle of the lane. Then when she had to make a left turn, something frightening happened -- she froze. Her husband, Michael, a 66-year-old retired cardiologist, told me, "She had been having memory problems and visual-spatial issues for some time, but that was the day I knew in my heart something serious was wrong." Soon after that Ellen, a 61-year-old counselor from Yankton, South Dakota, was diagnosed with Alzheimer's. Ellen had just joined the ranks of the more than five million Americans with Alzheimer's, and Michael had just become one of the estimated 15.4 million people who help care for them. "When we received the diagnosis from a neuropsychologist, we went out and sat in the car, crying and holding each other for more than an hour," says Michael. "It took us completely by surprise. We were stunned. All of her other tests had been normal." When I received the diagnosis I cried much of the time. I lost weight. I didn't want to tell anyone about it. I kept wondering -- why me? I felt like an impaired person. I had spent all my life helping other people and here I was needing so much help myself. After about two and a half years, I finally came to terms with it. I knew that Michael loved me and so did my children. My spirituality also helped me. I became aware that I wasn't alone. Most importantly, I chose to be happy rather than cry all the time. I realized that life can be good even when it seems impaired." Alzheimer's has changed the relationship between Ellen and Michael. He tells me it has brought them closer. Another change is in the division of household chores. Ellen used to pay all the bills and do all the cooking. Michael has now taken over both. "Actually," he says, "Now that I'm retired I enjoy cooking. I like to try new recipes." As I wrote in an article published here on the Huffington Post recently, experts concur that people with Alzheimer's can and do have the capacity to feel joy. And Ellen bears that out. Despite her condition, she has many activities that give her joy in life. She just loves tending to her vegetable garden and she's ecstatic when bicycling or kayaking with Michael and friends. She can still do both as well as ever. Michael says, "We have lots of laughter, mostly about little things that happen throughout the day. We enjoy being outside in nature. And we really enjoy visiting with our children." When I asked Ellen what she would most like for the general public to know about Alzheimer's, she said firmly, "Every single person in the United States should help support research into Alzheimer's." "Alzheimer's is under-diagnosed. Many people who have it don't know it and are not seeking help. Primary care physicians need to be more proactive in diagnosing the disease. Finally, we need to put a fire under our legislators to increase federal funding for research." Ellen was just selected by the Alzheimer's Association to be one of ten members of its Early-Stage Advisory Group. This group, composed of people in the early stages of dementia, was formed in January 2006 to gather information about current early-stage programs and to explore the best ways to provide services to the emerging early-stage population. Each member serves a one-year term. The Advisory Group has three main focus areas: programs, consumer awareness and advocacy. Other high-level goals are, among others, reducing the stigma of Alzheimer's, changing the face of the disease to reflect the full disease continuum, and improving physician education and sensitivity. Ellen's duties as a member will include acting as a spokesperson for national and local media opportunities and advocating for increased funding for research and support programs. "The amazing thing about the people on the Advisory Group is that they all refuse to let their diagnosis define who they are. They are all doing as much as they can for as long as they can to improve the situation for future generations. And they are all inspiring others to do the same." Are there other people with Alzheimer's out there who would like to share something about their experiences living with the disease? For more information about Alzheimer's disease, visit the Alzheimer's Association website or call the 24/7 Helpline at 1.800.272.3900. Marie Marley is the award-winning author of the uplifting book, Come Back Early Today: A Memoir of Love, Alzheimer's and Joy. Her website has a wealth of information for Alzheimer's caregivers.